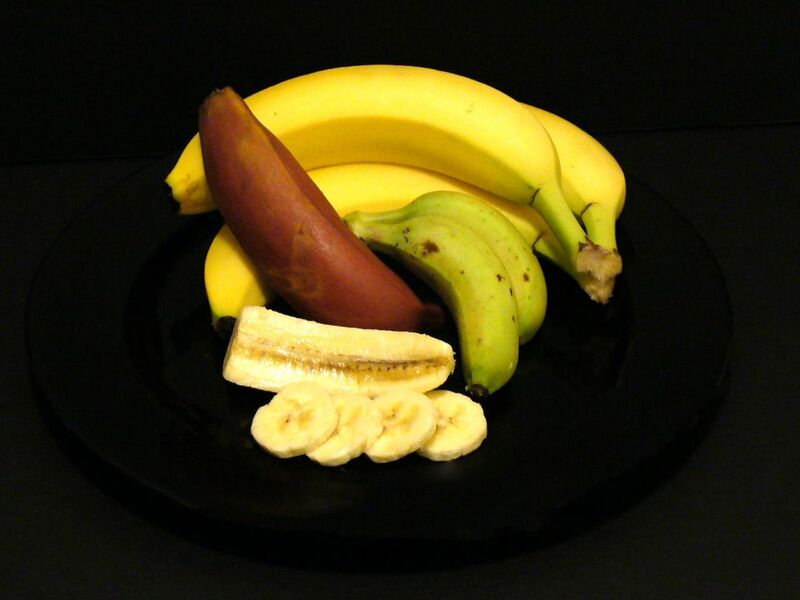 Bananas go through a ten-color spectrum, from when first picked and green to when they're mushy and brown. They are the only fruit that actually develops better color, texture, aroma, and sweetness as they ripen after harvest--and this happens quickly. The tiny seeds within the fruit release a ripening hormone, a mixture of ethylene gas and carbon dioxide, that cause bananas to have somewhat of a small ideal eating window. The best color stage to buy bananas is when they are right in the middle of the spectrum--mostly yellow with a small amount of green at both ends. You may want to select bananas based on your usage timeframe. Choose some already ripe (yellow with brown spots) for immediate use, and some still slightly but not overly green to use later. Pick bananas that are bright in color, full and plump, avoiding those with bruises--depressed, moist, and dark areas on the skin usually signal the fruit inside is bruised. A dull, gray color indicates they have been either chilled or overheated during storage. Ripe bananas show no trace of green skin. If you are unable to easily break the stem to peel the banana, it is not yet ripe. If the skin is difficult to separate from the fruit, it is most likely too starchy and bitter to eat (without cooking) and could cause digestive distress and/or constipation if eaten raw. The fullest flavor is derived from bananas that begin to develop tiny dark specks, known as sugar specks. Bananas should be stored at room temperature away from direct heat and sunlight. You may also want to keep them by themselves as they will hasten the ripening of other fruits in their vicinity. In the summer bananas may ripen more quickly, while their ripening is slower in the winter time. There are ways to speed up and slow down the ripening process. To stunt ripening, refrigerate the bananas for several days. Although the skins will turn brown, the fruit itself will be fine. For full flavor, allow the refrigerated fruit to come to room temperature before consuming. You can speed up the ripening process by placing the bananas in an open paper bag on the counter. Once ripened, bananas will keep a maximum of two days before they begin to decay. Peeled bananas should be eaten immediately; exposure to the air will cause discoloration. Bananas can be frozen whole, but the texture will be softer when thawed. Freeze them in their skin and save for later use in baked goods or blended drinks.